UPDATED: Josie's Juice interview with Rosemary and Oliver Zammit here. UPDATED: SEE THE '60 MINUTES' EXTRA MINUTES CLIP HERE. And an additional '60 MINUTES' EXTRAS CLIP HERE. "So, how did he die?" 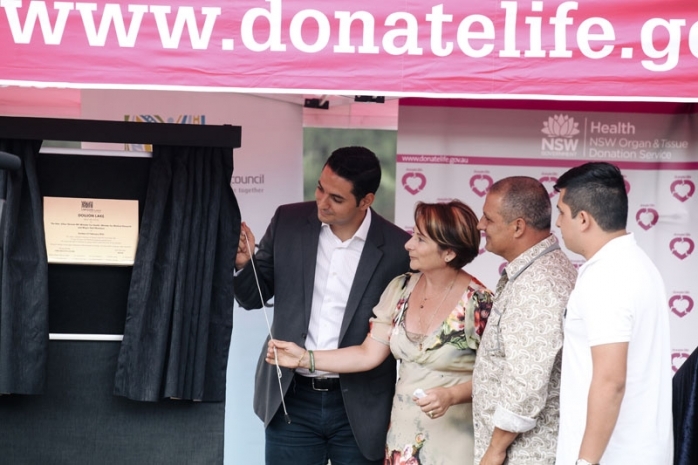 My daughter has just asked me the question about Doujon Zammit, after seeing the four page spread in today's 'Good Weekend' magazine in 'The Sydney Morning Herald' about him and his beloved family, the man who gratefully received his heart Kosta Gribilas, and all those affected by his untimely and brutal death. A young man she will never know, but with whom she has a wonderful relationship with his mother Rosemarie and father Oliver (Olly), and younger brothers Zeake and Laurent, particularly Zeake, with whom they play rumbles and have cuddle-fights. Up until last night, I did not have the heart to tell her that her beloved friends had another family member as part of their family. An older brother, a first-born son. Well actually, I had told her. It's just that she can't remember. 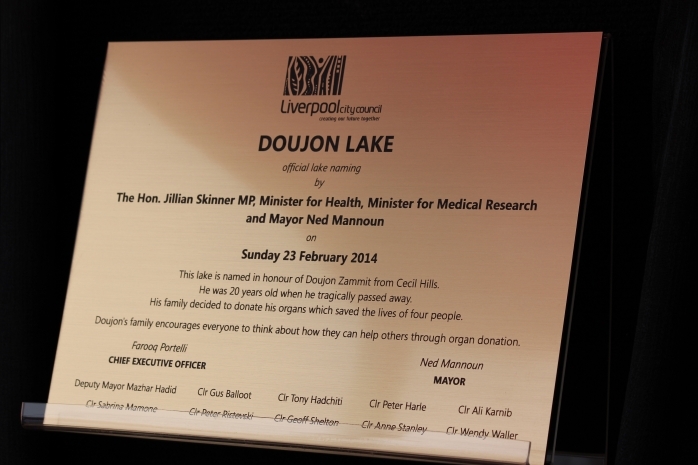 We had attended Doujon's memorial service at Dunumbral Park in Cecil Hills two years ago, where a monument was erected in his honour, and it was announced by Health Minister Jillian Skinner that the Geographical Names Board of NSW had given approval for the lake at Dunumbral Park to be renamed Doujon Lake. 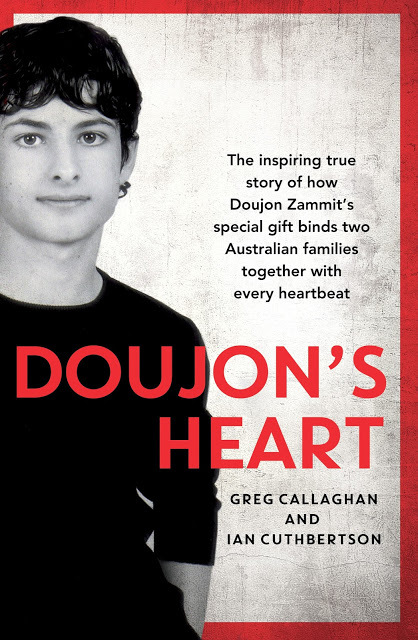 Next week, Ms Skinner will be at the book launch of 'Doujon's Heart', the book written by Greg Callagahan and Ian Cuthbertson, the former of which is the 'Good Weekend' acting editor. How do I tell my daughter? How do I tell her there are brutes in the world who treat others like animals and subsequently take lives. "Was he, like, sick Mummy?" "Yep, he was sick," I reply. "That's how people normally die, isn't it. That way, and cancer," she says innocently, like she knows all there is to know in the world. Except Doujon didn't die that way. The way he died was brutal, not fitting of the full and happy and party-loving young life he led, of the nurturing and loving household he came from, of the fact that he was barely in the double digits of his years. I have been struggling all day to finish reading the online piece featured on today's SMH site, which is an extract from 'Doujon's Heart'. But you should. And I will. And I asked my husband to go buy 'The Sydney Morning Herald' so I could hold the piece and read it again. Right now, I just can't. I am privileged to be attending the book launch for 'Doujon's Heart' next week, and I know it will be a difficult day for all. 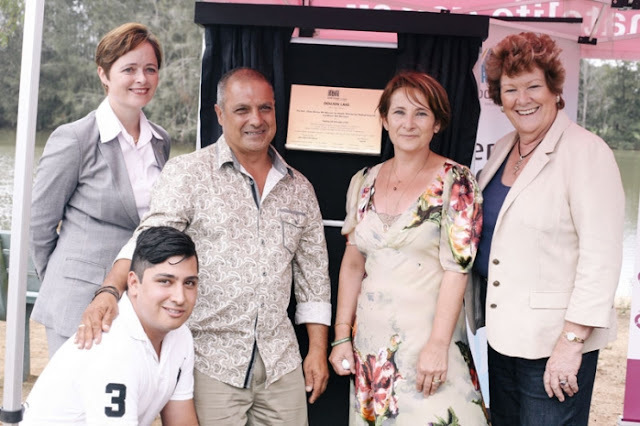 But I also know this book has been a long time coming, a labour of love with the Zammit family, and the Gribilas family - Kosta Gribilas is the recipient of Doujon's heart, and he and his wife Poppy then went on to marry and have a baby girl Konstantina. Their life tests have so far been huge. And as it says in the book extract, the parents "face their most traumatic test yet." I will never forget how I felt when I first read the news about Doujon's fateful chain of events. I was mother of baby twins, in my home office, scanning the headlines. What…? A Sydney man… bashed in Mykonos? Oh my God, who? What happened? Is he okay? Wait, what? The Zammit family? We know the Zammits. They were at our wedding. My husband's family friends. Three handsome young boys, all with distinctive names. Doujon Zammit? NO. My blood goes cold. I tell my husband when he gets home. I can't speak for the crying. I hit refresh and Google search several times that day, and the next. When news comes through that he has died, my heart crumbles. As do many who knew him, even those who don't. It's such a tragic story, it could be anyone's son, on their first overseas holiday. A candlelit vigil is held in the same park which will later have its lake renamed in his honour. More than 800 people attend. Olly speaks down the line from Greece, detailing how a recipient will receive Doujon's heart. Family and friends openly weep. The day of the funeral: the huge church in Horsley Park is overflowing. The grief is palpable. I went home and cried and cried. I hugged my kids. I tried to imagine a mother and father's grief like that. I couldn't. I didn't want my brain to go there. None of us would. There is so much to this story, and it's very relevant to topics on our radar today: organ donation, one punch 'king hits', overseas travel and the dangers for foreigners. And yet, there is even more to the story, more than many know. You can see the new '60 Minutes' interview trailer here. You can read more about 'Doujon's Heart' and how to pre-order here. You can read the Josie's Juice interview with Olly and Rose on king-hits here. You can read how the Zammit family are involved in the 'Unite Against Violence' walk here. And you can see the 2008 '60 Minutes' Australia Liz Hayes interview transcript with the Zammit and Gribilas family here.